Nancy will teach you ballet steps and help you choreograph (that’s fancy for create) your very own ballet. You can even record video of yourself performing your ballet routine alongside Fancy Nancy! Then, you can share your ballet performance with your family and friends! Includes great new iOS 6 features including Facebook sharing and in-app content purchases (in an area for Parents), as well as AirPlay mode so the whole family can dance along! ❀ Watch the included app demo video for inspiration, and, remember, practice makes perfect! Fancy Nancy Ballet School was developed in consultation with accredited ballet teachers and tested in children's ballet schools. 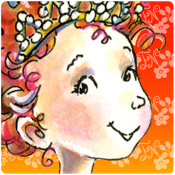 The app was created by a team of parents who love Fancy Nancy just as much as you do! We bring a 15-year background in educational interactive play for kids, so you can count on lovely learning experiences for your children. Enjoy! For more information on Fancy Nancy books and products, including the Dress Up and Explorer Extraordinaire apps, visit the official website at www.fancynancyworld.com and sign up for the Bonjour! e-newsletter. Become a Fancy Nancy fan on www.facebook.com/fancynancybooks to collect fancy tips, connect with fancy friends, and more!